This recipe is not only delicious, but it’s also very nutritious. Make it even more nutritious by using different colored peppers — the variations represent different micronutrients. Cooking Tip: Place steak in the freezer until partially frozen, but the tip of a sharp knife can still pierce it 3/8″ deep. This makes it easier to slice. Slice uncooked steak into thin slices across the grain and place in a shallow bowl. In a small bowl, mix meat marinade and pour over beef. Marinate in the refrigerator for 30 minutes. 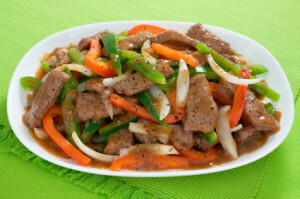 Prepare vegetables: thinly slice peppers, onions, and mushrooms. Mince garlic. In a skillet, add 1 tablespoon oil. Add onions and saute over medium high heat until the edges take on light brown color. Add garlic and peppers. Stir. Remove sauteed vegetables to a dish using a slotted spoon when tender and lightly browned on the edges, but not soft. Turn heat to high and add 1 tablespoon oil. Add the steak to the hot oil. When meat begins to brown, add mushrooms. Once all the meat is browned, add vegetables back in and pour sauce over mixture. Tip: Serve with brown rice to balance the carbs, protein, and fat.